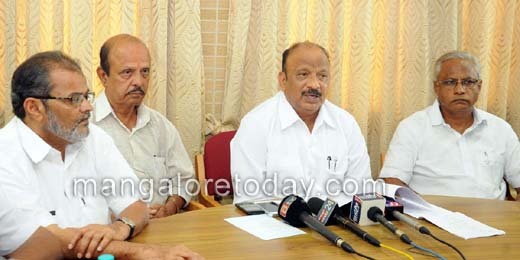 Mangaluru, Aug 5, 2016: It is reported that Minister for Urban Development Roshan Baig said that he will direct the MCC, Mangaluru City Corporation to file an implead application in the SC, Supreme Court to get clearance to draw water from the Lakya dam for meeting drinking water needs in Surathkal. Lakya dam situated in the Kudremukh National Park area was built by KIOCL, Kudremukh Iron Ore Company Limited to store ore sediments. After the KIOCL stopped its operations in Kudremukh, the KIOCL obtained permission of the Supreme Court to use 2MGD of water from Lakya dam for its unit in Mangaluru. The pipeline that used to bring iron ore in liquid form now brings water. With the Supreme Court nod, about 6MGD water can be drawn from Lakya dam and can be used for supplying water to Surathkal region. Speaking to media he said that Ashraya houses for the poor will be constructed under the Rajiv Gandhi Rural Housing Corporation at Kulshekar. Stating that houses for civic workers has been sanctioned, the Minister said that an estimate has already been prepared. The ground plus three floor apartments will be constructed. Directorate of Municipal Administrator has given a nod for housing facilities of civic workers. The minister who has also inspected the work new vented dam at Thumbe said that the civil works of the dam has been completed. The work on electrification and painting is pending which will be taken up after the monsoon. The feasibility report for the Karnataka Integrated Urban Water Management Investment Project (KIUWMIP) under ADB funded project in Mangaluru is in progress. Under the second phase of ADB-funded project, Rs 160-crore has been earmarked for drinking water and Rs 120-crore for the underground drainage works. Under Atal Mission for Rejuvenation and Urban Transformation (AMRUT) a sum of Rs 160-crore has been sanctioned to Mangaluru, of which Rs 154-crore would be used for the regeneration of underground drainages in old municipality area, Rs 4 crore for storm water drains and Rs 2 crore for the development of parks. Later, the minister laid foundation for civic workers house at Mahakalipadpu (Rs 240 lakh), laid foundation for B V Road Highland to Attavar (Rs 180 lakh), initiated development of Ganapathi High School road (Rs 150 lakh). He also inspected crematoriums at Hoige Bazar, Nandigudde and Boloor. Now the meting is held so when will the project stared?